After being bought by online retailer Amazon, digital comics platform ComiXology has discontinued its legacy iOS application and issued an entirely new release that lacks a digital storefront, allowing the company to avoid Apple's 30 percent cut of in-app purchases. ComiXology has one of the top grossing iPad apps for years. 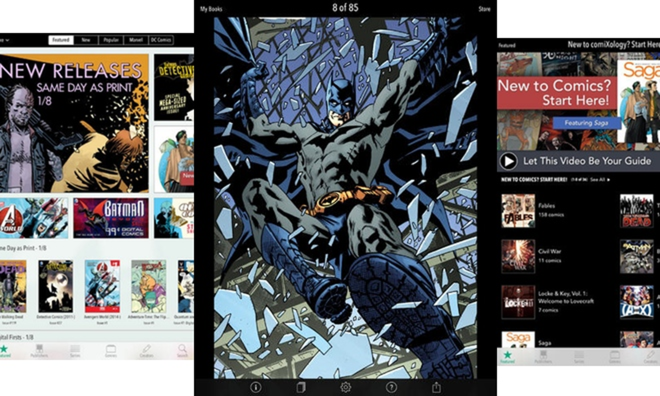 ComiXology sent out an email to customers on Saturday vaguely stating that a "new" application for iPhone and iPad has been released, while the old one is being retired. At no point does the email explain to users that the new version lacks a digital storefront, meaning users must access the Safari browser to purchase new titles. As a carrot to entice users to switch over, the company has offered customers a $5 ComiXology gift card. Switching to the new application requires users to sync their in-app purchases in the legacy application, then installing the new option from the App Store and logging into their account. The switch comes shortly after Amazon announced it had purchased ComiXology, which is responsible for the popular iPad and iPhone app named "comics." It has consistently ranked near the top of the iOS App Store's top grossing charts for iPad, while ComiXology is also responsible for the official iPad comic reading applications for major publishers Marvel, DC, Image, and more. Others, such as Dark Horse, have their own separate iOS applications and digital platforms. As of Saturday, the applications for Marvel, DC and others remain untouched, and users can continue to purchase digital titles through the iOS apps. But those who upgrade to the new ComiXology must access the service's website to buy content. That's the same approach Amazon uses with its Kindle platform, which lacks the ability to buy titles through the official Kindle app. Instead, users must visit Amazon in their browser to buy books, and those titles can then be downloaded and read through the official iOS app. Amazon does this to bypass Apple's App Store rules, which guarantee the iPad maker a 30 percent cut of all content sold through downloadable applications. By forcing users to access a browser, Amazon can keep its percentage of sales without needing to pay 30 percent to Apple.